John has been a professional nature photographer since the early 1970s. 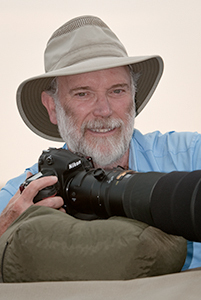 His work has been published in many publications and books, including National Geographic, Nature’s Best, National Wildlife, Audubon, Outdoor Photographer, and many others. In 1997 he received the first-ever Outstanding Photographer Award given by NANPA (North American Nature Photography Association), and in 2019 received their Lifetime Achievement Award. Nikon chose him as a featured Legend Behind the Lens in 2002, while Microsoft designated him an Icon of Imaging in 2006. He has been part of Epson’s Stylus Pro fine art print makers group since 2001. Over the years John has published six books on nature photography, eight eBooks on Photoshop and Lightroom, plus two eBooks of photographs. His latest book, John Shaw’s Guide to Digital Nature Photography, came out in 2015. He has photographed on every continent, from the Arctic to the Antarctic, from Provence to Patagonia.